The top US military commander in Afghanistan says the decision to deploy the bomb known as the “Mother Of All Bombs” was purely tactical. As many as 36 suspected Islamic State (IS) militants were killed when one of the largest conventional bombs ever in combat was used on Thursday evening in the eastern province of Nangarhar, Afghan defence officials said, adding there were no civilian casualties. The statement could not be independently verified, and on Friday Afghan and foreign troops in the vicinity were not allowing reporters or locals to approach the scene of the attack. Pentagon officials said the US commander who ordered the use of the bomb did not need President Donald Trump’s approval. Wresting the border areas of Afghanistan from the hands of insurgents may simply not be possible, writes C August Elliott. NATO commander in Afghanistan, US General John W Nicholson, has had standing authority since before Mr Trump took office to use the largest non-nuclear bomb ever dropped in combat. 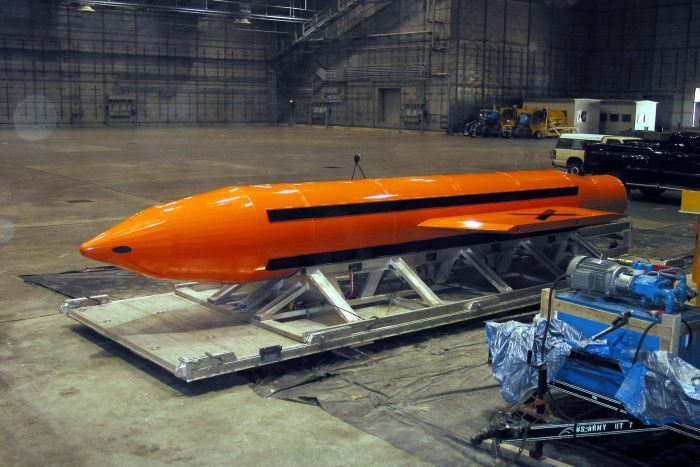 General Nicholson said he was in constant communication with officials in Washington, but the decision to use the 9,797-kilogram GBU-43 bomb was based on his assessment of military needs and not broader political considerations. “This was the first time that we encountered an extensive obstacle to our progress,” General Nicholson said of a joint Afghan-US operation that has been targeting IS fighters since March. Afghan and US forces were at the scene of the strike and reported that the “weapon achieved its intended purpose”, General Nicholson said. The bomb’s use attracted enormous attention, but the aim of the attack was relatively mundane by military standards — to destroy a tunnel and cave complex used by IS fighters in a remote mountainous area of eastern Afghanistan. 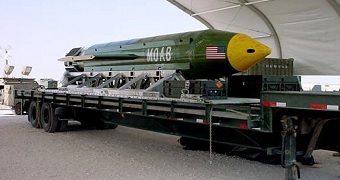 PHOTO: The US targeted a GBU-43 bomb at caves and bunkers housing IS fighters in Afghanistan. General Nicholson had a secondary goal in mind, however, according to an official who spoke on condition of anonymity in order to discuss internal matters. The official said General Nicholson wanted to demonstrate to leaders of the IS affiliate in Afghanistan the seriousness of his determination to eliminate the group as a military threat. Use of the weapon had nothing to do with sending a message to any other country, including North Korea, the official added. What is the Mother Of All Bombs? Where did it come from? Why is it being used now? And what does it mean for the future of international warfare? Some questions explained. Afghan Defence Ministry spokesman Dawlat Waziri said no civilians were harmed in the massive blast that targeted the network of caves and tunnels, which had been heavily mined. “No civilian has been hurt and only the base, which Daesh [IS] used to launch attacks in other parts of the province, was destroyed,” General Waziri said. 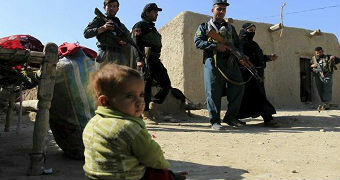 Afghan forces were at the tunnel complex assessing the damage, he added. General Waziri said the bombing was necessary because the complex was extremely hard to penetrate, with some tunnels as deep as 40 metres. “It was a strong position and four times we had operations [attacking the site] and it was not possible to advance,” he said, adding that the road leading to the complex “was full of mines”. The GBU-43 is a GPS-guided munition that had never before been used in combat since its first test in 2003, when it produced a mushroom cloud visible from 32 kilometres away. The bomb’s destructive power, equivalent to 11 tonnes of TNT, pales in comparison with the relatively small atomic bombs dropped on Japan at the end of World War II, which had blasts equivalent to between 15,000 and 20,000 tonnes of TNT. In Achin village, about 5 kilometres from the remote, mountainous area where the bomb was dropped, witnesses said the ground shook, but homes and shops appeared unaffected. “Last night’s bomb was really huge, when it dropped, everywhere, it was shaking,” said resident Palstar Khan, adding that he believed no civilians in the area were hit. He praised the strike, saying killing IS fighters was a “positive move”. Other residents said they were used to seeing militants climbing up and down the mountain every day, making occasional visits to the village. “They were Arabs, Pakistanis, Chinese and local insurgents coming to buy from shops in the bazaar,” resident Raz Mohammad said.